International Series of Monographs in Analytical Chemistry, Volume 50: N-Benzoylphenylhydroxylamine and its Analogues covers the analytical applications of the organic hydroxylamine derivatives. This book is composed of seven chapters, and starts with a brief historical account of the uses of organic reagents in inorganic analysis. The next chapter discusses some basic physico-chemical factors associated with the constitution of a good reagent, including some fundamental ideas about the type and nature of the principal reactive and other groupings in the ligand. A chapter deals with the inclusion of the methods of preparation and properties of N-benzoylphenylhydroxylamine (BPHA) and its analogues and derivatives, and their reactions with different metal ions. These topics are followed by descriptions of the various types of analytical applications of BPHA and its analogues, such as gravimetry, spectrophotometry, and solvent extraction, as well as their applications in titrimetry and paper chromatography. 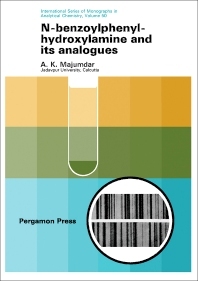 This book is of value to analytical and organic chemists.